And Now We’re Running Out Of Stamps, Too! Some Democrats are upset and advocacy groups are outraged over the raiding of the food-stamp cupboard to fund a state-aid bailout that some call a gift to teachers and government union workers. House members convened Tuesday and passed the multibillion-dollar bailout bill for cash-strapped states that provides $10 billion to school districts to rehire laid-off teachers or ensure that more teachers won’t be let go before the new school year begins, keeping more than 160,000 teachers on the job, the Obama administration says. But the bill also requires that $12 billion be stripped from the Supplemental Nutrition Assistance Program, commonly known as food stamps, to help fund the new bill, prompting some Democrats to cringe at the notion of cutting back on one necessity to pay for another. The federal assistance program currently helps 41 million Americans. Arguably one of the most outspoken opponents on the Democratic side is Connecticut Rep. Rosa DeLauro, who has blasted the move as “a bitter pill to swallow” but still voted yes. The cynical political reasoning behind this move is the same as that which informs the Democrats’ position on school choice: Union members vote; poor people often don’t (and their children, trapped in terrible schools, can’t). So much for the Democrats’ carefully cherished self-image as the “party of compassion”; let’s hope Americans don’t forget, when the rubber hit the road, where the Democrats’ first allegiance lay. And I’d be willing to bet that a lot of those people collecting food stamps would rather simply get a job — that is, if they could, in the Obama economy. There was a study last year that showed half of all American children will at some point in their lives rely on food stamps. Yes, 50%. So how many children will have to go hungry because of a couple Republicans in the Senate? So Republicans hate children, do they? The $26 billion stimulus bill to states — which included a $10 billion gift to the National Education Association and other teacher unions — came with a price: A curtailment in spending on food stamps. Naturally, many of the robo-Democratic congressmen failed to read the bill as they flew in to D.C. to pass it, collect their sound-bites and fly back to vacation. The public is reading the bill. 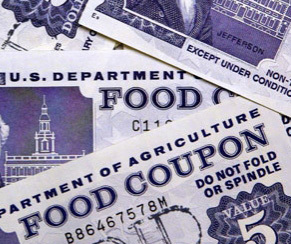 It strips $12 billion from food stamps. Same old rhetoric from Obama–punishing businesses–so it’s all ok. States wouldn’t want to follow New Jersey Governor Chris Christie’s lead, would they? If the states could find the cuts, they wouldn’t need to pillage the American taxpayer, and then they wouldn’t need a bailout. California is broke, yet their teachers are the highest paid in the nation. So, private sector greed is bad, but public sector (taxpayer funded–as in, you are taking your neighbor’s hard-earned money) greed is good? Everyone knows that what the Democrats passed is another bailout–but, while the Democrats help their teacher base and spin that it’s for the children during this election season, another segment of the Democrat base will eventually suffer–the poor and families on food stamps. How will they explain that away? Additionally, the military and other departments and programs will be hit hard as a result of this legislation. Below is the list of budgetary rescissions compliments of the new “fiscal hawks” in Congress. It’s interesting how Democrats can find budget cuts and have no problem hurting the poor, working families, middle class, defense, and military, when it benefits the teachers and the unions on the US taxpayer’s dime. If the Democrats are so willing to make these cuts (some permanent), reallocate appropriated funds, and rescind funds from the original stimulus bill of 2009 to meet the pay-go requirement, then why did they use unemployed Americans as political pawns in June when a deficit neutral unemployment bill was introduced and reported here on Big Government? They could have fast-tracked that bill so that millions of unemployed Americans could have continued to receive benefits without a break–all in a bipartisan manner. We’ve seen it splattered all across the front pages; more spending for jobs, more spending for bailouts, more spending for Unemployment, more spending for Teachers and Unions and special interests. We’ve also seen deficits rise and the National debt reach numbers that don’t fit on WalMart calculators. America is bankrupt and they (the ruling Political class) don’t even know it…or they don’t seem to care anyway. What else explains why they’d happily starve the “least among us” or force them to trample each other to death, fighting over a paltry scrap from the Master’s table? And for all that so-called “stimulus” money that promised jobs we still don’t have, homes we still can’t afford, and infrastructure improvements (that would keep America working for a generation) that remain undone, why are we paving roads that cars can’t drive on?? Why do I have to find out about it while skimming state news about National candidates instead of seeing it splattered all across the so-called Media?